Longtime San Francisco Giants broadcaster and SABR member Hank Greenwald, 83, died on October 22, 2018, after an onset of bronchitis, following months of heart issues and kidney failure, at California Pacific Medical Center in San Francisco. With a broadcasting career that spanned 40 years across the country, Greenwald was most well-known as the Giants' lead radio voice from 1979 to 1996. With a wry sense of humor that endeared him to Bay Area fans, Greenwald was "enthusiastic, hearty, and a fan of the game to his core," as Stuart Shea wrote in SABR's Calling the Game. Howard "Hank" Greenwald was born on June 26, 1935, in Detroit and grew up listening to Hall of Famer Harry Heilmann call Tigers games. He changed his name to Hank in honor of Tigers great Hank Greenberg. Greenwald graduated from Syracuse University, where he earned a bachelor’s degree in radio and television and called the football exploits of Jim Brown and Ernie Davis. He began his professional career at a small radio station in New Jersey. “They let me do ten minutes of sports at night and I told people I was a sportscaster,” he once said. He soon returned to his alma mater and called play-by-play for Syracuse football games, along with minor-league baseball and the Syracuse Nationals of the NBA. Basketball was the impetus for Greenwald's move to the West Coast in the late 1960s, when he began broadcasting games for the NBA's San Francisco Warriors. He also served as KNBR's sports director and occasionally called Oakland A's games after their move to California. That experience helped lead him to the Giants' job in 1979. In the beginning, he backed up veteran Lindsey Nelson but Greenwald soon took over the top job and his breezy wit and gift for storytelling helped him become a beloved member of the broadcast team for 17 seasons until he retired in 1996. 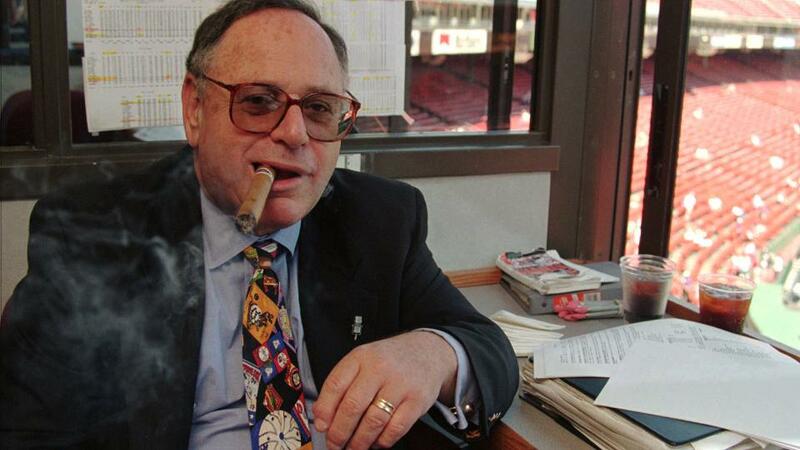 "The easiest part of the business is to describe what happens on the field," Greenwald told SABR's Mark Simon in 1996. "The toughest part is filling time between pitches, making that interesting to people. A sport like basketball carries the announcer, but an an­nouncer has to carry baseball because nothing happens. The amount of time the ball is in play is less than five minutes. The rest is what you make it." He left KNBR in 1986 for a two-year stint calling New York Yankees games before returning to the Giants in 1989, when they won the National League pennant. Greenwald stayed busy after leaving the Giants, broadcasting the "Saturday Game Of The Week" for CBS Radio and two seasons doing TV games for the Oakland A's. He also wrote a book, This Copyrighted Broadcast, sharing his favorite and most memorable stories during a lifetime behind the microphone. He is survived by his wife, Carla, and his children, Doug and Kellie. Doug is also a longtime SABR member and a broadcaster with the Triple-A Fresno Grizzlies. This page was last updated October 23, 2018 at 4:26 pm MST.